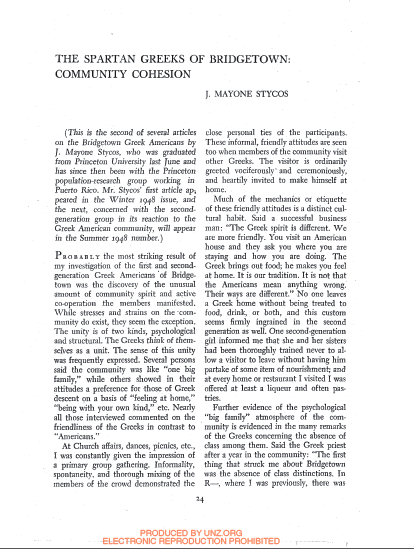 "Probably the most striking result of my investigation of the first and second-generation Greek Americans of Bridgetown was the discovery of the unusual amount of community spirit and active co-operation the members manifested. While stresses and strains on the community do exist, they seem the exception. The unity is of two kinds, psychological and structural. The Greeks think of themselves as a unit. The sense of this unity was frequently expressed. Several persons said the community was like "one big family," while others showed in their attitudes a preference for those of Greek descent on a basis of "feeling at home," "being with your own kind," etc. Nearly all those interviewed commented on the friendliness of the Greeks in contrast to "Americans." . . . . "The Greek spirit is different. We are more friendly. You visit an American house and they ask you where you are staying and how you are doing. The Greek brings out food; he makes you feel at home. It is our tradition. It is not that the Americans mean anything wrong. Their ways are different. . . . "